Elephants have it rough. Between being poached for tusks, and captured to be made into working elephants, these beautiful giants need some incredible people who will stick up for them. One of those individuals is Lek Chailert, founder of Elephant Nature Park, located in Chiang Mai, Thailand. 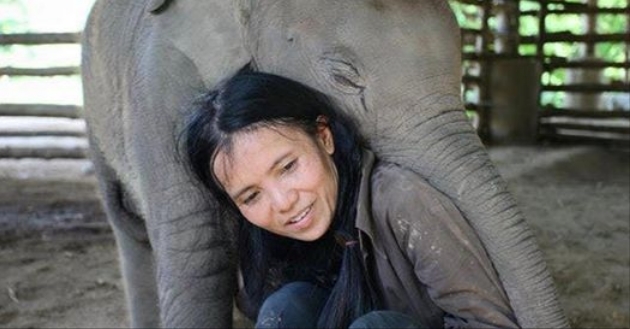 Running the sanctuary, Chailert has devoted her life to rescuing elephants and educating the world about the horrors that they face in the tourism and logging industries. These working elephants are separated from their mothers as calves and “broken” through weeks of physical abuse so that they become submissive to their trainers. After this, elephants are forced to perform backbreaking labor from morning to night, taking tourists for rides through the forests or clearing trees in the logging industry. In Thailand half of all 3,000 to 4,000 elephants are domesticated for work. Altogether, Chailert has helped free almost 100 elephants from abusive situations. The care given to the residents at Elephant Nature Park is often the first time these animals have experienced love from a human being. In the photo below, it’s easy to see that these elephants have as much love for their caretaker as she has for them. Responses to "Baby Elephant Thanks Kind Woman Who is Working to Save Her Kind"